Two things. First, these ribs are frickin amazing! 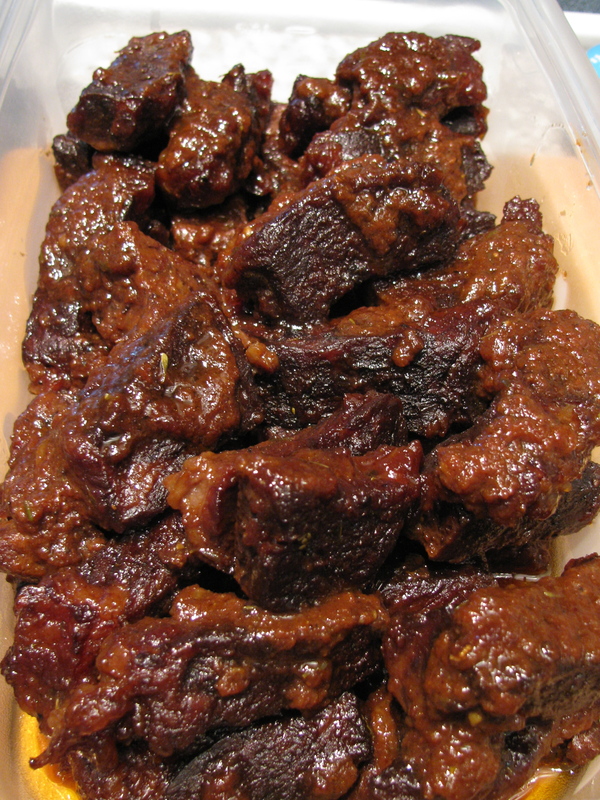 Second…this recipe is a modified version of Sunny Anderson’s Short Rib recipe. I needed a meat dish for a party I was attending and was dying to try ribs. After lots of searching I found this easy recipe and let me tell you….it rocked my world! The ribs were practically falling apart and are so tasty your taste buds will squeal with delight. In fact my mouth is watering just thinking about them. Give this one a whirl. If you’ve never made short ribs you’re in for a treat. If you have, then this recipe won’t disappoint. Cut the short ribs into 3-inch long pieces and remove any excess fat. Arrange them in a 13 by 9-inch baking dish and season with salt and pepper. Combine all the remaining ingredients in a small bowl, and stir to incorporate. Pour the sauce over ribs and toss to coat all the pieces. Cover with aluminum foil and roast until cooked through and tender, about 3.5 hours. Remove the foil during the last 30 minutes of cooking to brown the top. Transfer to a serving platter. Use a spoon to remove the grease from the BBQ sauce. Pour over the ribs and serve. Serve these tasty ribs with potatoes. Any potato dish would go well. How about roasted fingerlings or garlic smashed red potatoes? You could even bake a russet, split it and then serve the ribs on top. Serious yumminess! Pair with a stout! Guinness would go great…so would a chocolate stout. Pork ribs are an inexpensive alternative to beef short ribs. Bone in ribs would work as well as boneless. These look amazing! Are they really this easy? My husband would LOVE this and this would be good on game day –thanks for sharing! The picture alone made my stomach growl. I am definitely going to try these. They look superb! Mine too! My mouth was watering as I was writing the post 🙂 I loved how easy this was to make. Let me know how they turn out if you try them.